Simon Morden returns to the magical world of Down for second time in The White City. He rejoins the survivors of Down Station (reviewed here) as they try and come to terms with events and the world they find themselves in. They came to Down, Narnia-like, through a doorway in a disused tube station as London burned around them. They found a dangerous world populated by people who came through different doorways from London at different times in its history. That first book ran very much along lines of some classic fantasy – people find themselves in a magical world and have to learn to use the powers that they gain there to survive. The White City turns out to be a very different proposition to the first book in this series. With the rules established in Down Station, Morden sets about not only exploring those rules but also breaking them apart, digging deeper into the world and revealing depths that were only very vaguely glimpsed in the first volume. There is a bit of a quest element to this book as the characters travel to the White City, reputedly the only permanent city in Down, where answers may be found that may give them a way home. But again, Morden subverts expectations. The city is found relatively quickly but what is found there will fundamentally change their understanding of the world. Once again, the narrative flips between its two fairly young protagonists – Dalip, a young Sikh man, breaking free slightly of the structures of his upbringing, and Mary a wild child from the wrong side of London’s tracks. Their friendship and belief in each other gives this story real heart and they both grow considerably in this book. Once again, the untrustworthy Crows is a principle driver of their troubles but The White City throws some new characters into the mix including a group of “gentleman pirates”. 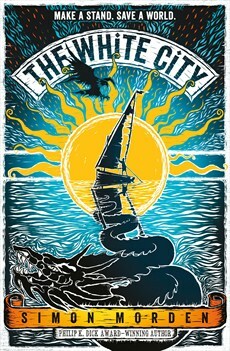 The White City is a great adventure tale with a dark heart. Morden starts in a fairly dark place, making clear that no character is safe and that the stakes are always high. There are plenty of cliffhangers as the narrative flicks between the two leads and of course, the book ends on a slight cliffhanger, or at least with plenty of issues still to be resolved. Like all good second books mysteries are solved but in the process deeper secrets reveal themselves. While Down Station was a slightly offbeat but fairly standard alternative world origin story, The White City proves that this was a series worth sticking with.